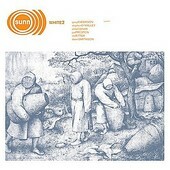 Sunn 0))) continues to barrage the senses with its own cacophonic sounds and unintelligible noise rock. On the outfit's fifth release, those with short attention spans need not apply; this music is twisted, macabre, and borderline unlistenable, unless you're an ogre, a morphine addict, or severely mentally unstable. Explorative doesn't even scratch the surface when speaking about Sunn 0))). Unlike any music you've ever heard, this horrifying display of dramatic noise will make your delusions reality if you choose to play the whole three-track, 60-minute plus disc in its entirety.